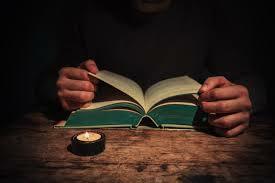 Engage in reading a book on spiritual ideas for 15 minutes every day. These practice is called "lectio divina". Share your favorite spiritual books on this blog by sending your suggestions to davidgmarkham@gmail.com or leaving your suggestions in the comments. A Course In Miracles. It's not for everyone, but if you are someone who the Course speaks to, it is outstanding. It is not a book you sit down and read. It is like a holy scripture that you study. I have been studying it now for almost 30 years. I have engaged in Lectio divina for 55 years. I always have a spiritual book going. I have learned so much and it is one of my most favorite times of the day. I find it relaxing, inspiring, and illuminating. One of my favorite spiritual teachers is Osho and there are tons of books now which are transcriptions of his talks. I always learn something from his talks.